Shakhrisabz (Uzbek: Шаҳрисабз Shahrisabz; Tajik: Шаҳрисабз; Persian: شهر سبز‎‎ shahr-i sabz (city of green / verdant city); Russian: Шахрисабз), is a city in Qashqadaryo Region in southern Uzbekistan located approximately 80 km south of Samarkand with the population of 53,000 (1991). It is located at the altitude of 622 m. Once a major city of Central Asia, it is primarily known today as the birthplace of 14th century Turco-Mongol conqueror Timur. Formerly known as Kesh or Kish (i.e., "heart-pleasing") and tentatively identified with the ancient Nautaca, Shahrisabz is one of Central Asia’s most ancient cities. It was founded more than 2,700 years ago. 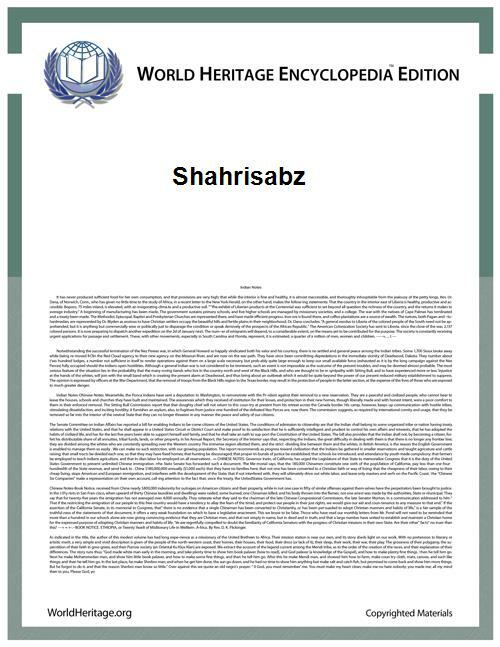 Its name was officially changed to Shahrisabz in the modern era. From the 6th to 4th centuries BC it was a part of Akhemenid empire. Alexander the Great's general Ptolemy captured the satrap of Bactria and pretender to the Persian throne, Bessus, at Nautaca thus ending the once great Achaemenid Empire. Alexander the Great chose to spend his winters and met his wife Roxanna in the area in 328-327 BC. From 4th to 8th century Kesh was one of urban centers of Sogdiana. Between 567 and 658 rulers of Kesh paid taxes to caghans of Turkic and Western Turkic caghanates. In 710 city was conqured by Arabs. Shahrisabz was the birthplace of Timur on April 9, 1336, to the family of a minor local chief, and during the early years of the Timurid Dynasty, enjoyed its considerable patronage. Timur regarded Shahrisabz as his “home town” and planned it eventually to be the location of his tomb. However, during the Timurid period, the center of activity shifted to Samarkand instead. According to legend, The Khan of Bukhara, Abdullah Khan II had the city destroyed in a fit of rage over the death of his favorite horse from exhaustion on a steep approach the city, but was later overcome with remorse for the damage he had done. 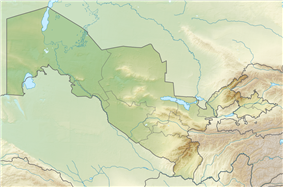 The city struggled for autonomy under Bukharan rule. The Russians helped Bukharan emir to conquere the city in 1870. Remains of the Ak-Saray Palace. Timur's Summer Palace, the “White Palace” was planned as the most grandiose of all Timur's constructions. It was started in 1380 by artisans deported by Timur from the recently conquered Khwarezm. Unfortunately, only traces of its gigantic 65 m gate-towers survive, with blue, white and gold mosaics. Above the entry of the Ak-Saray are big letters saying: "If you challenge our power - look at our buildings!" A Friday mosque built in 1437 by Ulugh Beg in honor of his father Shah Rukh, its name meaning “Blue Dome”. Located immediately behind the Kok Gumbaz Mosque is the so-called “House of Meditation”, a mausoleum built by Ulugh Beg in 1438 but apparently never used for burials. East of the Kok Gumbaz is another mausoleum complex called Dorus-Saodat (Seat of Power and Might), which contains the Tomb of Jehangir, Timur’s eldest and favorite son. The adjacent mosque is said to house the tomb of a revered 8th century imam Amir Kulal.